At Envirocraft, we are the proud providers of a number of waste management and recycling services, which are accredited to both ISO9001 and ISO14001 – we really know what we’re talking about! At our base in the beautiful, rural surroundings of Cheshire, we are COMAH1 registered with 24 hour CCTV in operation, providing a fully secure setting for our operation. With access to a 40,000 square foot for vehicles of all sizes our service is well thought-out. 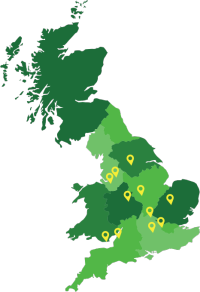 We have a further 10 branches across the UK allowing us to provide our services to businesses and some households around the country, as well as providing our WEEE collection services throughout Europe, making us a serious front runner in our field. Specialising in WEEE recycling and hazardous waste disposal, we also provide a number of additional services to our customers, delivering fully comprehensive waste disposal solutions to customers requiring all manner of disposal and recycling amenities. We work predominantly on commercial sites, though also provide domestic waste disposal services for households. We are committed to environmentally-sound practice, maximising the amount diverted away from landfill in a consistently legally-compliant manner. To arrange efficient and comprehensive waste disposal and recycling solutions for your premises, get in touch with the team of experts at Envirocraft today and let us help the environment whilst helping you. With our no-obligation, free quotes for all our customers, we are always happy to help.